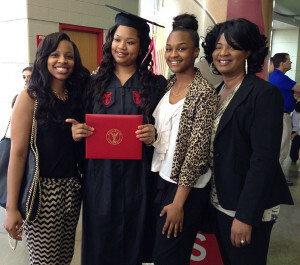 Janetta Sykes, graduated from Ball State. She received her Bachelors of Science in Health Science. She is the first in her family to receive a college degree. At home, there are 6 younger siblings all looking to her achievement as a role model for what is possible! The day was filled with celebration, joy, and pride as her Mom, Dad, aunt and uncle and two oldest sisters, as well as Mrs. Kozlowski were in attendance as she crossed the stage to receive her diploma. She will be interning this summer with the American Diabetes Association of Indianapolis, with the potential to be hired to coordinate their African American programs. Discussions are already underway! The economic freedom Janetta dreamed of acquiring, as well as the personal freedom to aspire beyond the confines of her poverty are now a reality as her education has truly set her free.